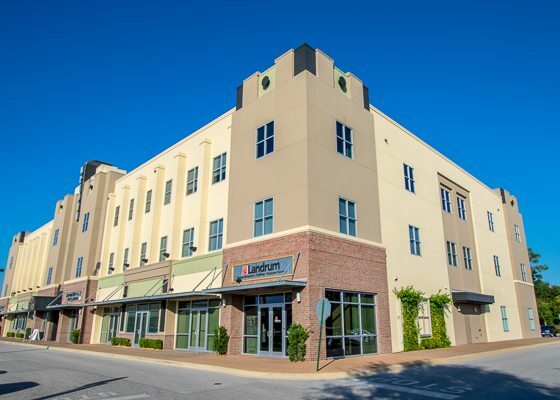 The Jay Odom Group acquired the land and permitted and constructed this 79,438 square-foot, three-story, Class A office and retail building in the heart of Fort Walton Beach’s Uptown District. With close proximity between Eglin Air Force Base and Hurlburt Field, JG Plaza is a technologically advanced building featuring redundant fiber optics capability and a biometric fingerprint scanner for after-hours lobby access. The HVAC system is highly efficient with computerized temperature control monitoring and fresh air pre-cooling systems that create an extremely comfortable work environment. JG Plaza contains hypoallergenic insulation and utilizes environmentally conscious janitorial services. For leasing information, contact The Jay Odom Group Leasing and Property Manager, Emily Gregory, at 850-654-4126, Ext. 104.